This remarkable spring ephemeral is unique to Minnesota and occurs only in the southeastern counties of Rice, Goodhue, and Steele (the populations in Hennepin and Carver counties were introduced prior to the species' listing as endangered). Erythronium propullans is one of only two or possibly three plant species endemic to Minnesota, and the state's only federally endangered plant species. It was discovered in 1870 near Faribault in Rice County by Mary B. Hedges, a botany instructor at St. Mary's School, and described the following year by Asa Gray (Gray 1871). Preserving wild plants in their natural habitat appears to be the best hope of ensuring the survival of this rare species. Habitat destruction has occurred through ignorance, cattle grazing, incompatible recreation uses, logging, agricultural expansion, and residential developments. Erythronium propullans was listed as a state endangered species in 1984 and as a federally endangered species in 1986. Erythronium propullans is a distinctive species, but it bears a superficial resemblance to E. albidum (white trout lily). The two species can be difficult to separate when in sterile form, but are easily separated when in fruit or flower. However, it is important to understand that only a very small percentage of E. albidum plants will flower in any given year, usually far less than 1 percent. On the other hand, nearly every individual of E. propullans will flower each year. For this reason, if a carpet of non-flowering Erythronium leaves are seen covering a forest floor (a common sight in early spring) it can be fairly certain they are all E. albidum. If E. propullans were present, then flowers would be seen. The flowers of E. propullans are smaller than those of E. albidum (often only 1 cm (0.39 in.) long) and are sometimes pinkish rather than white. They also have only 5 petals rather than the 6 petals of E. albidum. Fruits of E. propullans are also smaller and, when mature, are nodding rather than erect. Offshoots of E. propullans arise not from the bulb as in E. albidum but from the stem above the bulb, and only from flowering plants. The above-ground parts wither and disappear as the summer progresses. The habitat of E. propullans is most commonly a wooded floodplain or river terrace, or a north-facing slope above or near a stream. The plants typically occupy the lower part of the slope but may extend nearly to the top of the slope or descend into the level floodplain. This is a deeply shaded habitat in the summer, but E. propullans completes its life cycle in early spring before the trees leaf out. 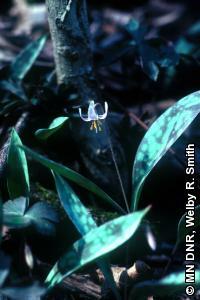 Erythronium propullans occurs in colonies that range in size from one or two scattered plants to more than 500 individuals, and it may often be intermixed with colonies of E. albidum. The origin of this distinctive species is uncertain, but it is believed by Morley (1978) to have evolved in the vicinity of Faribault after the retreat of the glaciers 13,000 years ago. Because of its inefficient system of reproduction and dispersal, E. propullans has expanded its range very little and remains restricted to small portions of certain drainage systems in only three Minnesota counties. Published research reveals that E. propullans rarely if ever produces seeds (Banks 1980, Morley 1982). In fact, the only time fruits are produced is when the flowers are cross-pollinated with E. albidum (Banks 1980), giving rise to hybrids. It appears that this species reproduces largely, if not entirely, by asexual means through the production of offshoots. Attempts to artificially propagate this species have generally been unsuccessful. The best time to search for E. propullans is during the brief flowering period that extends from mid-April through about the 10th of May. Historic habitat destruction occurred through logging, conversion of floodplains to cropland, and grazing. Present habitat loss is largely the result of ignorance, incompatible recreation uses, and residential developments. Loss of the Ulmus spp. (elm) canopy in floodplain habitat, earthworm infestations, over-use by white-tailed deer (Odocoileus virginianus), and proliferation of invasive species such as Rhamnus cathartica (common buckthorn), Phalaris arundinacea (reed canary grass), and Alliaria petiolata (garlic mustard) threaten the species even at protected sites. Soils on sites supporting E. propullans are generally quite erodable and caution should be used in mechanical removal of non-native species to ensure that seedbeds are not created for other invasives. Chemical control of non-native invasives may be possible during the late summer and fall when E. propullans and its companion native ephemerals are no longer above ground. Approximately half of the known E. propullans populations are now in the ownership of various public and private conservation organizations. However, active management has generally been lacking. Long-term monitoring is underway at numerous sites to detect population trends and habitat changes. The construction of a retaining wall along Prairie Creek at Nerstrand Woods State Park and a shoreline stabilization project on private land along the Cannon River have been undertaken to minimize bank erosion from flash flood events and loss of E. propullans habitat. Banks, J. A. 1980. The reproductive biology of Erythronium propullans Gray and sympatric populations of E. albidum Nutt. (Liliaceae). Bulletin of the Torrey Botanical Club 107:181-188. Converse, C. and W. Smith. 1984. Element Stewardship Abstract. The Nature Conservancy. Gray, A. 1871. A new species of Erythronium. American Naturalist 5:298-300. Morley, T. 1978. Distribution and rarity of Erythronium propullans of Minnesota, with comments on certain distinguishing features. Phytologia 40:381-389. Morley, T. 1982. Flowering frequency and vegetative reproduction in Erythronium albidum and E. propullans, and related observations. Bulletin of the Torrey Botanical Club 109(2):169-176. United States Fish and Wildlife Service. 1987. Minnesota Trout Lily (Erythronium propullans Gray) recovery plan. United States Fish and Wildlife Service, Twin Cities, Minnesota. 31 pp.